Flat-rate rewards. This card has a 1.5% rewards rate on all purchases with no annual fee. Redeem rewards for any amount. The Quicksilver is one of our picks for the best credit cards of 2019. 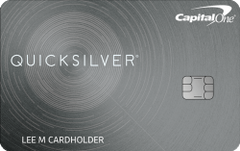 Our take: Quicksilver from Capital One is a solid credit card with a 1.5 percent cash back rate and no annual fee.